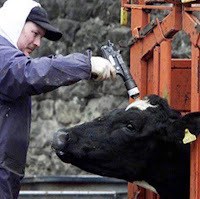 The slaughtering of these more highly evolved animals produces strong emotions such as fear and anger which remain as vibrations in the meat itself and increase people’s naturally aggressive and/or fearful tendencies. According to a study of more than 120,000 people carried out over 28 years it is scientifically proven that regularly eating red meat increases significantly risk of death from heart disease and cancer. The food one eats has an effect on the clarity and upliftment of the mind; it plays an important role not only in bodily health but also in one’s spiritual life. 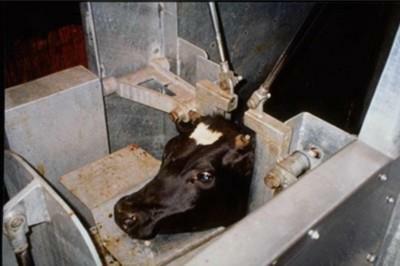 In the pictures below look at the eyes of the cow they say it all. Cow is Devine. 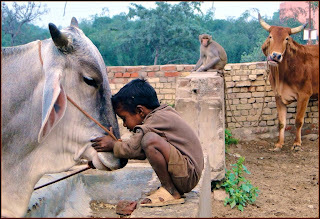 if a person only has cow and nothing else he can still survive without eating her meat ofcourse. 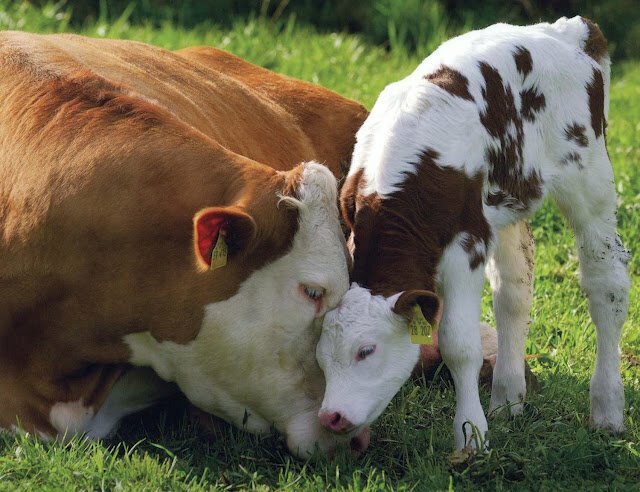 it can provixe you with everything that a mother does to its child.milk, shelter, security to name a few. 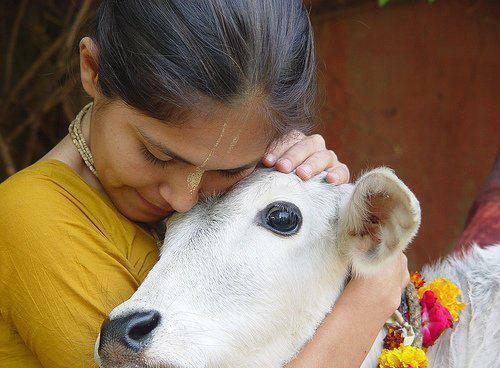 if you have a cow at home there certain peace at home a feeling of content. Over 50,000 cows are killed everyday in india. I dont know how to save them, in gujrat cow slaughter is banned. It should be banned everywhere. I used to buy leather products in past without checking if it was cow leather. Even hindus are sell cow leather. No wonder this country is going down in a negative direction. 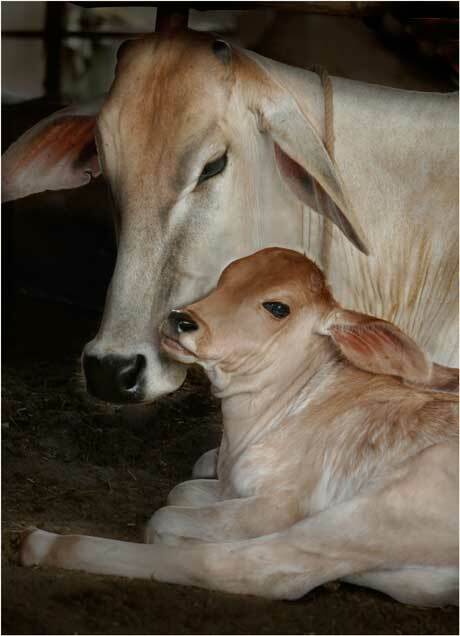 I really dont know how this is happening in this nation where cow is considered as mother. Shame on this modern country called india. 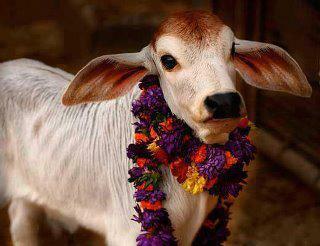 may Lord krishna save all the cows!!! And let every cow killer and eater rot in hell!!! Good initiative brother.. feeling happy after reading your thoughts and research on indian culture.. The most important thing about Desi cow is that it is a storehouse of "Prana Tattva".. Its the prana tattva which can give healing powers.. Human body is not made just from gross material elements element but also contains Prana.. When thsi prana is disturbed, it leads to various disorders... Many diseases can be healed by fixing the prana tattva.. 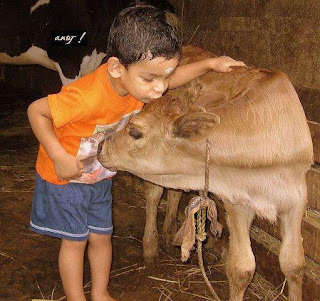 This is where cow becomes so important... the producst from a happy cow like milk, ghee, gaumutra have great healing properties as they are rich in Prana tattva.. It is years and years old practice to make leather from dead bodies and using it. Nothing is wrong in this, as now only body is left. But to kill just for this is wrong. But ones after natural death you can use the body. Even we are killing plants for food that is not considered a sin. Because life is this you need to depend on something for survival. 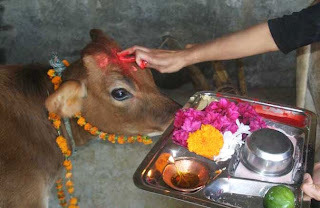 But slaugthering of cow , where god designed cow to provide milk and because of religious reasons is wrong. But using leather as a byproduct cannot be wrong . As cow is not primerely or only slauthered for leather. Rest is on beliefe.